We are normally closed every first Thursday of the month for Protected Learning Time. This is when necessary training and maintenance is conducted. Do you find it difficult to attend surgery during normal surgery hours due to work or other commitments? If so, then pre-bookable extended hours appointments will make things easier for you. 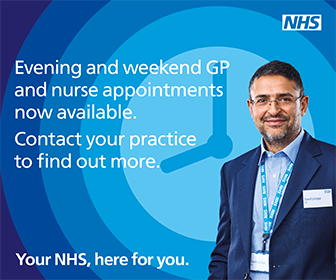 These are appointments designed for patients who would otherwise find it difficult to see a doctor during normal opening hours due to their daily commitments. The appointments can be made by telephoning the surgery during normal opening hours and can be booked up to 2 weeks in advance. These appointments are pre-bookable only and will also be made available through our internet booking service. The following details the service arrangements for our alternate evening and Saturday morning times. This means one week we will offer evening appointments and the following week Saturday morning appointments. We trust this will give a wider choice to people who sometimes find it difficult to attend surgery during the day due to work or other unforeseen circumstances. Extended hours surgery times are Monday 6.30pm to 8.15pm or Saturday 8.30am to 12.00pm. These appointments are limited as these will be staffed by one GP partner on any one day and may be subject to change during times of absence or other commitments of the participating doctors. You may not therefore be able to see your usual doctor during these times. When you attend for your appointment you will be need to use the intercom system which will be located inside the foyer as the inside door entrance to the building will be closed. The receptionist will release the door lock for you to enter and exit the building. If you are unable to attend your booked evening or Saturday appointment for any reason, it is most important that you contact the surgery to cancel (before 6:00pm) as these appointments are limited and can therefore be offered at short notice to other patients who might otherwise have to wait for an available appointment. The surgery reception will not be open during extended hours for collection of prescriptions, general enquiries or telephone bookings etc. We are also unable to provide nursing services during these times i.e., blood testing, dressings etc. therefore some patients may have to come back and see a Nurse. For information on what to do when we are closed, please see our Urgent problems and Out of Hours page.